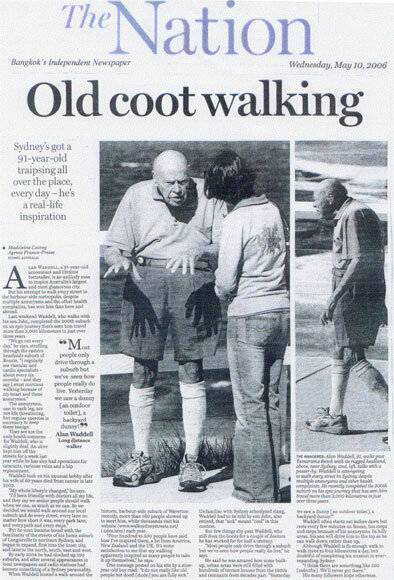 At the end of its preview of the opening of a new section of Sydney harbour and ocean track, the Manly Daily announced: "Among those who will walk is Alan Waddell, the 91-year-old who has walked every street in Sydney." Unfortunately, Alan still has quite a few streets to tackle. 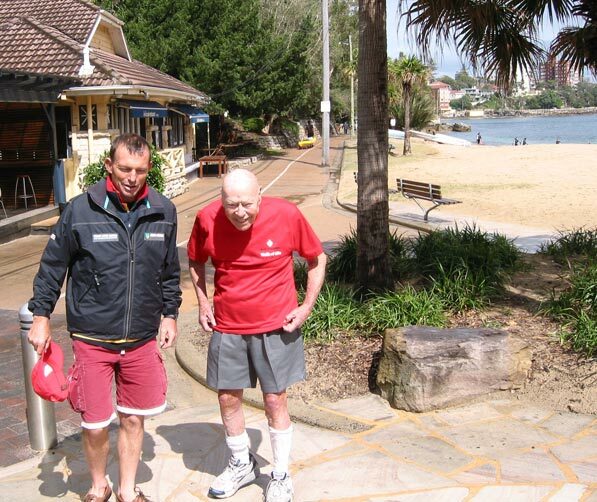 The following day, Alan accompanied Federal Health Minister (now Prime Minister) Tony Abbott for a 20-minute walk to officially have the track from Shelley Beach opened. Tony Abbott doesn't usually walk. He runs. More than that, he runs marathons. 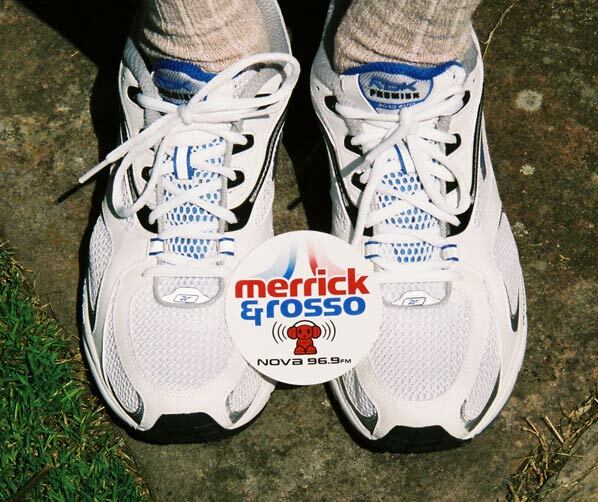 He even ran a 100-kilometre ultra-marathon for charity. The minister arrived by himself to the pre-publicised opening of this walk from Shelly Beach to a former defence establishment at North Head. After this, he was on his way (again by himself) to do volunteer work with the Surf Life Saving organisation. Australia is fortunate that senior government ministers can move freely without the security that is so evident in some other countries. The Leader has the largest circulation of any Australian suburban newspaper. This was their second item about Alan, concentrating on his walking in the southern suburb Oyster Bay. 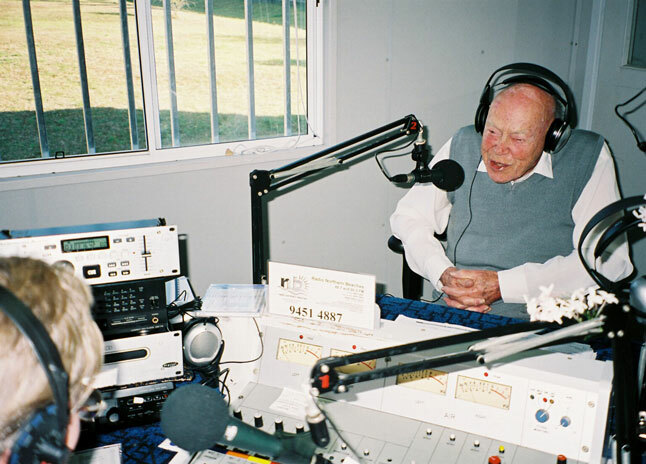 Philip Ashley-Brown's interview from 14 June scored yet another airing, this time in the "Overnight" programme broadcast around the country while most Australians were asleep. The capital city's breakfast programme carried Philip Ashley-Brown's interview that was originally heard in Sydney on 14 June. A mention of Alan's walking, website and morning tea with the station's afternoon programme producer caused a second of visitors. This complemented an earlier flood from the same day's ABC radio interview. During the breakfast programme, ABC radio's field reporter, Philip Ashley-Brown, interviewed Alan while they were walking the streets of Greenwich. "[He] has inspired thousands...an internet superstar." 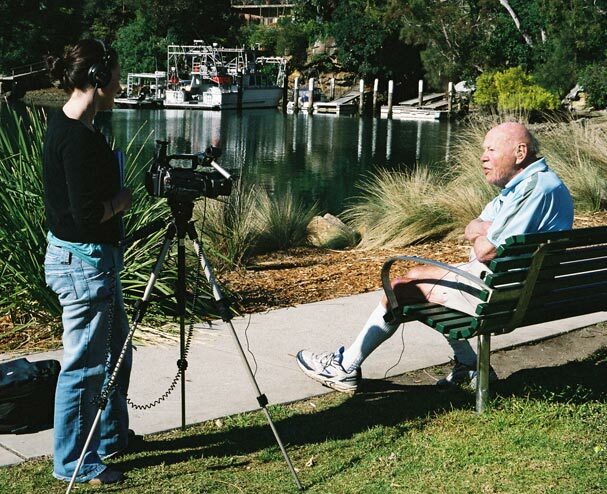 On the same day as the Canadian seniors' paper ran their story, the seniors' paper for Australia's island state emphasised the health aspect of Alan's walking, particularly for the heart. 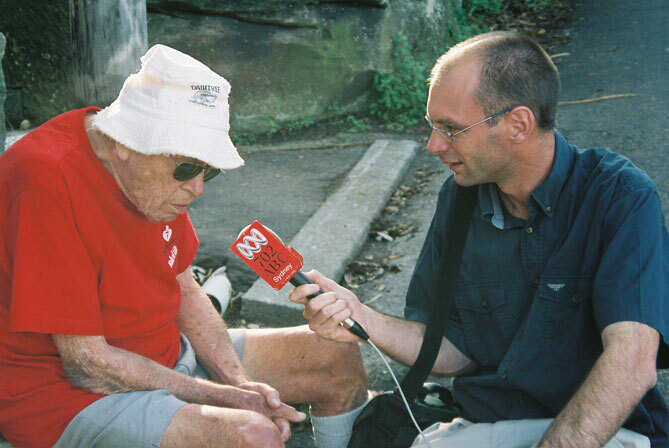 This newspaper for Sydney's older population began its story of the National Heart Foundation's recruiting of Alan with the line "Australia's own Forrest Gump, 91-year old Alan Waddell of Sydney's North Shore has been inspiring thousands of Australians to hit the streets." The photo caption read "Alan Waddell gives some fitness tips to Federal Health Minister (now Prime Minister) Tony Abbott." "Old coot walking" was the headline for a story and photographs covering most of a broadsheet page of this Bangkok newspaper, which sells about 60,000 copies daily even though not in the national language. Although some international newspapers/magazines had published their own stories about Alan's walking, the overseas coverage mushroomed with the release of a story by the news service AFP. We learned of this article six months after publication, yet the newspaper's incredible staff went to much trouble to hunt down a copy. The story is in Korean; an Internet translation site provided some idea of the content. Afternoon presenter James Valentine interviewed Alan for a special programme for those over 75. This government-operated station interviewed Alan in his role as a media ambassador for Seniors' Week. The morning host Simon Marnie pointed out that Alan's main challenge, leading a walking tour of one of his favourite areas, had to be changed to two tours following 160 bookings instead of the expected 20-25. Alan was noted as being "an ambassador to Seniors Week", part of which is his leading of a guided tour in the Sydney suburb Waverton. It has "well exceeded an expected registration of 25, with 130 people signing up." This international magazine with over a million readers readers in Australia plus about another 100,000 in New Zealand showed Alan with his worn-out socks and shoes protruding from the photograph into the text. That's Life brings both life and light to Alan's lounge room. The Record has the largest readership of any newspaper in Canada's Waterloo region. The topic of its "Web Pointer" column on the above date was this site, inviting readers to "join the journey of a charming old Australian guy as he endeavours to walk all the streets of Sydney ... [He is] snapping pictures (including lots of goofy poses) along the way. Make sure you check out the Surprises section for photos of unusual and interesting sites. Waddell has become a media darling Down Under and his fame is spreading fast across the globe" - Kitchener Record (Canada). This is the government-owned network of 230 stations throughout Australia. They carried a brief story about Alan's walking and his website. 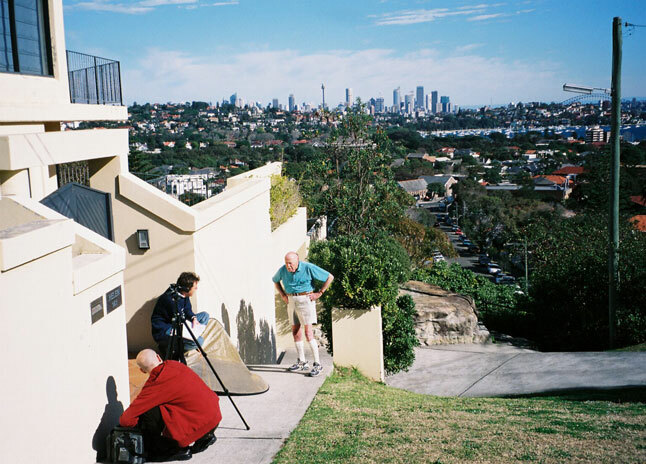 "In regard to the steepest street question, surely Column 8 needs to seek advice from Mr Alan Waddell, the 91-year-old gentleman undertaking the monumental task of walking every street in Sydney's suburbs," writes Mark Cannon of Penrith. "So far, apparently, he has walked the streets of more than 200 suburbs and his opinion on this matter must surely be sought." The lead story on the front page was headed "On the Road Again", illustrated with a photo of Alan competing with cars on the streets of Jamisontown. Suzanne El-Basel, 10, from Roselands, said she seldom met anyone as old as Mr Waddell. "I was very surprised because he was being very funny," Suzanne said. 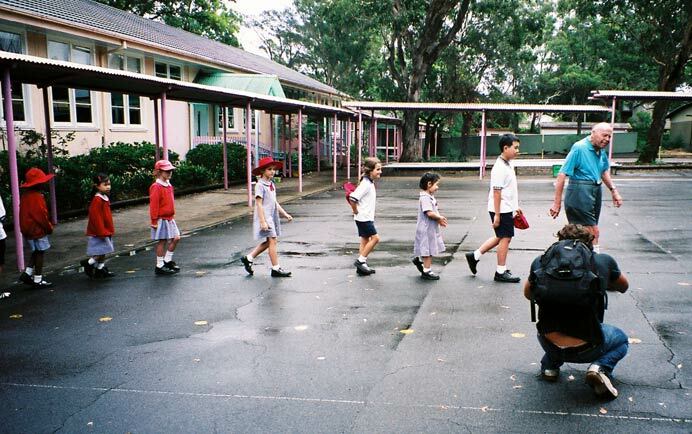 Photographer Wesley Lonergan captured 10 students following Alan Pied Piper-style. The St George and Sutherland Shire Leader was on hand to photograph Alan as he entered the assembly hall to address 600 students of Beverley Hills Public School. Alan, 91, walks every street in 191 suburbs of Sydney, Australia. He has taken photos of strange and wonderful things from garages to toilets. See if you can spot your house!" George Moore and Paul Kidd first spoke to Alan in August 2004. This time it was an extended 10-minute interview, covering everything from backpacks to dog attacks. Australia’s largest country network interviewed Alan for its evening programme. The interview was carried by 32 stations, including 2HD Newcastle, 2AD Armidale, FM100.3 Armidale, Zoo FM Cobar, Radio 639AM Coffs Harbour, 2DU Dubbo, 2GF Grafton, FM 104.7 Grafton, 2MO Gunnedah, Triple G Gunnedah, 2NZ Inverell, Gem FM Inverell, 2LM Lismore, 2VM Moree, Now FM Moree, 2MG Mudgee, Real FM Mudgee, Radio 1089AM Orange, 2PK Parkes, Radio 531 Port Macquarie, 2YM Tamworth, 2RE Taree, Max FM Taree, Radio 97AM Tweed Heads, 4GY Gympie, 107.1 Noosa and 4WK Toowoomba. The chat with Alan in the breakfast programme was the first of his two interviews on the station in the one day. Radio Nova sent Alan two new pairs of running shoes following his interview. 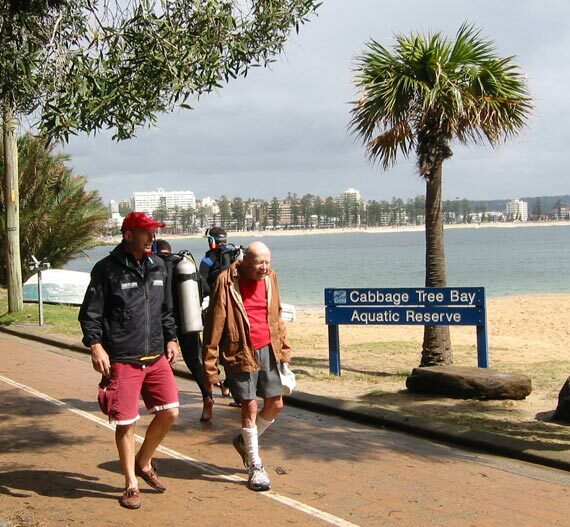 A story headed "Taking it all in his stride - 91-year-old's city walking mission" was accompanied by six photographs of Alan Waddell walking through Longueville, North Bondi, Zetland, Banksia, Asquith and St Peters. "I do feel stupid when people are in the park and I'm going up and down all the paths but they'll never see me again so it doesn't matter." "One 9-year-old boy said he didn't like old people usually but I was fully sick. I didn't know what that meant." The Chronicle ran a feature on marathon walkers in Manhattan, Christchurch, London, Minneapolis, Sydney and, of course, San Francisco. Alan Waddell was the Sydney representative; the story about him concluded with an email Alan had received: "I'm your best fan and I want to be like you, but it will take a while because I'm only 11." Since we don't all live in San Francisco, the rest of us can see the article and photos at Walking The World by Tom Graham. A second item has appeared in Guang Ming Daily, Malaysia's leading Chinese newspaper. It included a reproduction (picture and text) from our web site of the story dated 27 November below. When Wacky But True asked Alan Waddell if they could do a story about his walking, he knew he had finally made it! Stories in Australian Senior for the oldies, Who for the young adults and Wacky for the kids. This high-quality children's magazine aims to educate in a fun way. Their double-page spread about Alan included photos of the giant mail-box, officers' mess, hubcaps, wheelbarrow park and using your hat for a refreshing drink. As the article was in Chinese, we were at a loss to learn what they wrote about Alan, until we found a suitable translation programme. We are now able and proud to provide you with an excerpt. "Arran watt looks like the passenger who fills the curiosity, he walks while appreciates the vista, saw specially or the strange thing, then stops down photographs, then gives to the cart-driver son to post in walks Sydney's street the website." The two photos accompanying the story were the "don't walk" advice and the Concord Hospital steps. Sydney's Manly Daily ran a story about Alan's fondness for the quirky things he finds while walking, and showed him at the helpful "Road Ahead" warning sign. Their last paragraph listed countries where recent visitors to the web site live, concluding with "which has us worried what the rest of the world will think of Sydneysiders." The story was headed "Like, this 'fully sick dood' knows the 'burbs, man", wording which one would expect to see in a teenage magazine rather than a paper whose market is the over 60s. The journalist based it on an email Alan Waddell received which read, in part, "Dood, I was just watching Today Tonight and, man, you are doing really well, so don't give up. By the way, I am 9 and I do not really like old people, but dood you are fully sick." Three photographs (the Colebee hailstones, Greenwich contradictory signs and a Longueville hill) illustrated the item. This newspaper has an Australia-wide readership of 800,000. The video generated items on well-known sites www.fazed.net www.boingboing.net and www.happynews.com with a consequent flood of visitors. 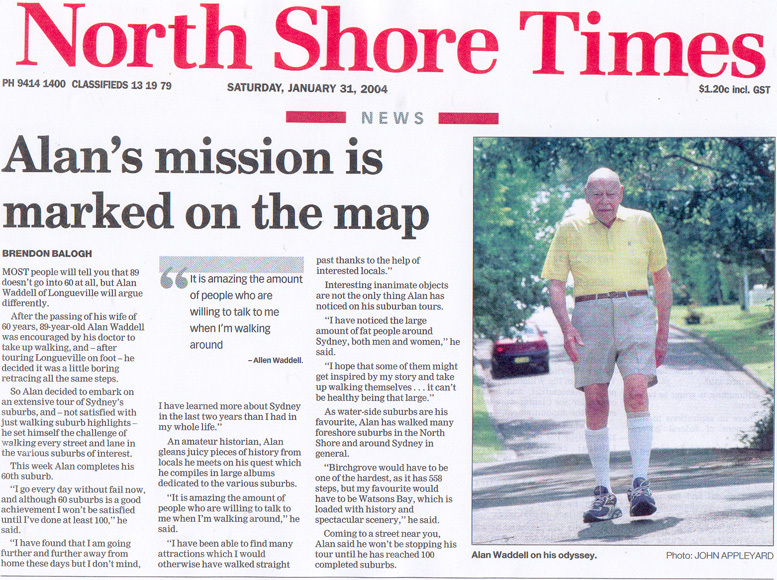 A three-page spread about Alan appeared in Walking New Zealand. It included eight photos of his favourite places around Sydney, which the magazine reproduced in such clarity that they seemed to put the originals to shame. The editor had heard Alan interviewed on Radio New Zealand's national network. Alan Waddell 's web site was featured by Radio New Zealand's in its "Web site of the Week" on its 38-station national network. Subsequently, they did a live 10-minute interview with Alan on 20 April 2005. Yahoo's write-up had links to the site itself plus direct links to houses, roads, toilets (they didn't miss any of the important parts) and park rules. It finished with advice to "have a look for a suburb you live in or know about and see if there is anything quirky Alan has noticed on his travels." Alan was interviewed by a radio station on the other side of the country, 6PR Perth, in its breakfast session. Alan's site was mentioned in the b3ta newsletter number 172. "The B3ta newsletter is sent out every Friday and has the best internet links we have seen that week. It currently has nearly 80,000 subscribers" - b3ta. As a result we have had another 5,000 new visitors. Alan had a letter published in the " Spike" section. As a result, in a single day we had over 2,000 new visitors looking at an average of 10 pages. Published under the heading "Bending the rules", the article read: "Responding to our call to expose some of the ridiculous rules plaguing our over-regulated society, reader Alan Waddell wrote: "As I walk around Sydney, it is easy to inadvertently break some of this growing number of prohibitions, such as singing in Willoughby Park. (Please see http://www.walksydneystreets.net for photos of the prohibiting sign and my singing there.) Fortunately, the very pleasant park staff forgave this 90-year-old's indiscretion." 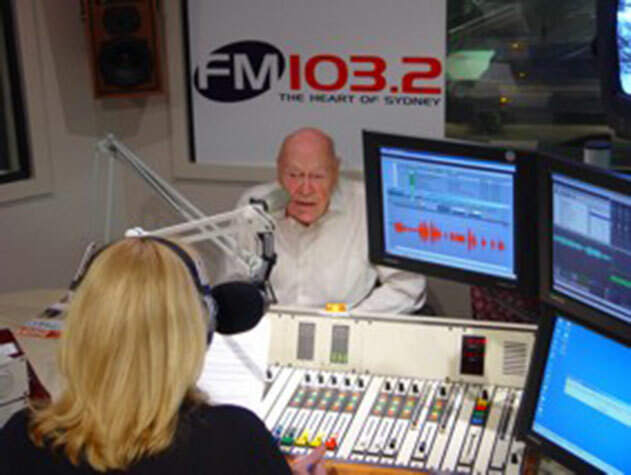 Alan was introduced to FM103.2 listeners as "Sydney's most famous walker". Here is the link to the FM103.2 web site for their original reference to Alan's website. For the article in the Hornsby and Upper North Shore Advocate, Alan was photographed on the link between Queens and Hazelmead Roads, Asquith. "What's that sheet for?" demands Alan of the WHO magazine reporter and photographer. "Is it to reflect sunlight on me for the photo, or to cover where I've hidden my normal walking cardigan?" Australia's prestigious newspaper, The Sydney Morning Herald, ran a story about Alan Waddell completing the walking of every street, road, avenue and lane in 100 Sydney suburbs. This was the article that first brought Alan to a wider audience - both in Sydney and overseas. On weekdays, The Sydney Morning Herald has 900,000 readers.